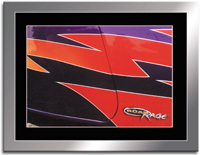 The perfect automotive decor for home, shop or office, these elegant, colorful images provide the enthusiast with an appreciation for the custom painters art. There's an example in a frame at right. Providing a new way to look at custom paint is my creative contribution. My images are simply the cameras framing of the selective compositions that my eye finds. Through my pictures Im trying to bring to the viewer some of the visual excitement I experience when I look at an elegant pinstriping design, a perfect pearl fender or a wild set of flames. I really love the interplay of color and textures in these surfaces. Ive been shooting hot rods and customs in car shows for years, and I enjoy the challenges these venues present to me. I cant control the lighting so I take advantage of existing conditions. I dont manipulate the images, I shoot straight: what you see is what you get. Indoor shows are very difficult, so I prefer to use sunlight and shade outdoors to get my best results. Visit the gallery pages for a selection of available images. This is only a small sampling, many more are on the way. The price of a standard 17 x 22 print is $30.00 US plus $5.00 shipping and handling inside the US and $10.00 outside the US. Images are custom printed to order. They are inkjet printed in high resolution, four-color (cmyk) on Epson Photo Quality Glossy Paper using an Epson Stylus 3000 four color printer with certified Epson inks. Prints are on C size paper, 17 x 22 inches, with an image area of approximately 14 x 20 inches. The image is outlined with a two-point-thick border in a contrasting color, surrounded by a rich gloss black border that extends out to the maximum printable area (approx. 16 x 21 inches). Each print is signed and dated and marked as an artist's proof (A/P). There are no editions of these prints (yet). Prints are shipped rolled in a tube. Its suggested that the print be laid flat upon arrival to prevent permanent rolled edges. We recommend dry mounting the print to foam core and matting in black, gray or a contrasting color, then frame behind glass in an appropriate frame of your choice. A 2 inch wide mat will provide an 18 x 24 inch framed picture. A 3 inch mat will give you 20 x 26 inch framed picture. Since all prints are custom printed to order, we probably wont ever have an e-commerce solution for ordering prints. Custom sizes and image combinations are also available. If youre interested in ordering, send us an email with your choice of image and we can discuss the details. Click here for a PDF form you can print out and FAX to us with credit card information or mail back with a check or money order.